Oregon Housing Blog: HUD Data Says There Are More Unsheltered Homeless Oregon Veterans In 2018 than 2017, But Not In All Areas. HUD Data Says There Are More Unsheltered Homeless Oregon Veterans In 2018 than 2017, But Not In All Areas. HUD recently did a press release HERE indicating that veteran homelessness nationally was down 5.4% from 2017-2018. The PR included links to HUD data for each state, as well as for each HUD Continuum of Care. The Oregon data shows that contrary to the reported national trend the number of homeless veterans grew by 112 (9%) from 2017 to 2018 to 1,363 and the unsheltered homeless veteran population grew by 95 (14.2%) to 763. 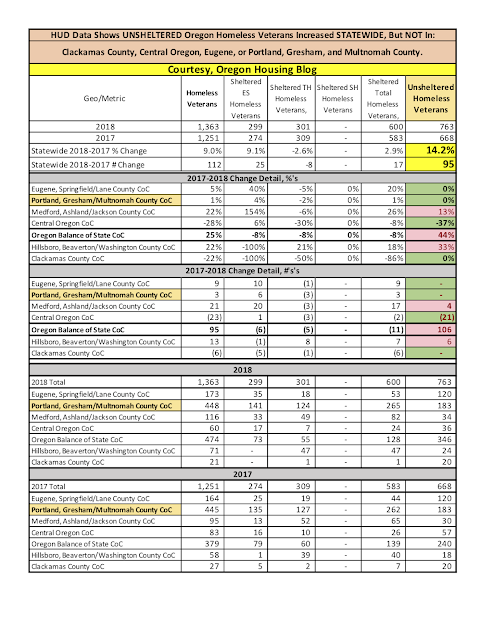 I dug deeper in the HUD data and found that Clackamas County, Central Oregon, Eugene, and Portland, Gresham, and Multnomah County CoC's did NOT have increases in unsheltered veterans. 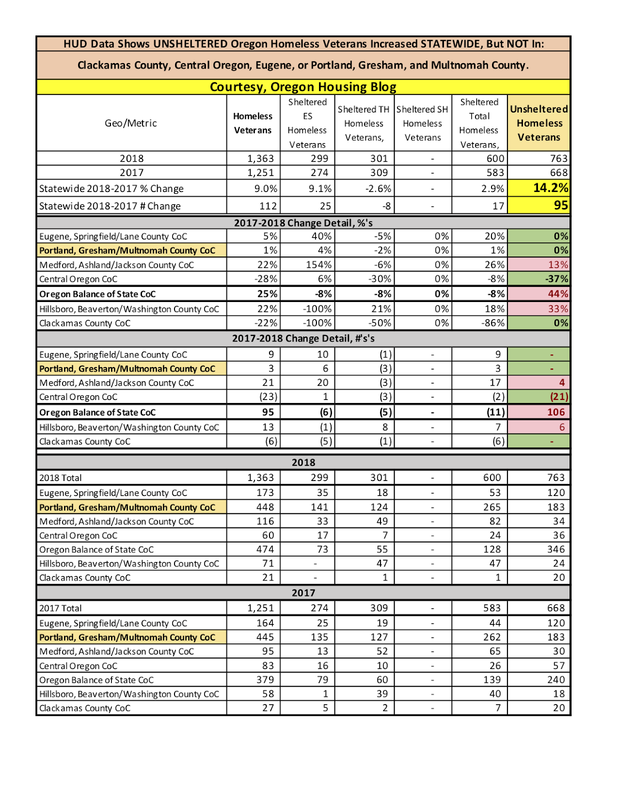 ALL of the increase in unsheltered homeless veterans occurred in Medford, Washington county, and the Balance of the State Continuums of Care. The pic below has my summary of Oregon veteran homeless counts statewide and for each CoC. [CLICK on it to enlarge].